The Lazy Dog Engineering LD-1B2 software defined shortwave receiver. The LD-1B a general-coverage, 100 kHz – 30 MHz, USB-controlled shortwave receiver. The LD-1B2 comes with an installed USB isolator, which improves the noise floor (and sensitivity) by about 6 dB over previous LD models. The LD-1B2 is manufactured by Lazy Dog Engineering–a “mom and pop” manufacturer–in the USA and is available from their website. It is available in kit and fully assembled form. Rear Panel: 3.5 mm stereo output jack, 3.5 mm stereo input jack (for planned transmitter module when available), 3.5 mm “stereo” accessory jack, USB mini-B for connection to host, SMA female antenna connector, and 2.1 mm x 5.5 mm coaxial female power connector (center positive). Reviews? Please contact us if you find a review of the LD-1B2. 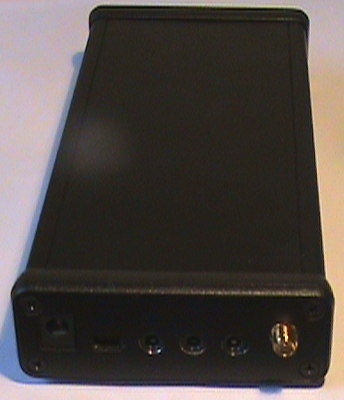 This entry was posted in Lazy Dog Engineering, Made in USA, Software-Defined Radios (SDR) and tagged Lazy Dog Engineering, Lazy Dog Engineering LD-1B2, LD-1B2, Made in USA, SDR, Software-Defined Radios. Bookmark the permalink.